Old, today very expensive book about the Organisation of the swabian Cercle. Although pre 1740s and pre 1756 very interesting. Some of the rare details about recruitment etc. of the swabian Cercle. Only important for studies about the problems between Württemberg and the other members of the Cercle before the War of the Polish Succession. The history of the town and fortress. The plans are great with a lot of details. Dozens of plans and drawings of the siege of 1744. The text is not really interesting because the lack of details. The book about the 1743-campaign (see The War 1.! Vol.5) has more details about the actions and a detailed OoB of the pragmatic army. A lot of details. Very old but still the best in the german language. Usefull. Some faults about the tactics. But very good to learn about the political/strategic background. Simpel but usefull. OoBs, plans (some in a bad Quality) and some informations about uniforms. Not really a part of the WAS, but very very interesting to learn about warfare in the mid 18th century. Mostly citations of the memories of Lieutenant Rauch. It's worth to read the notes in the new catalogue about duke Anton Ulrich of Sachsen-Meiningen to understand the point of view of von Rauch. It seams that von Rauch was a really brutal fellow, not the pleasant gentlemen he is in this old book (no surprise if you know that the author of the book was a officer of the saxon-gotha-army!). The catalogue is highly recommended but very difficult to get a copy (although it's printed in 2015!)*. Not really a biography, but very interesting in parts to learn about the saxon view on the WAS. Very interesting details about the political side: Fredericks succes in convincing Frederick August II. to subordinate the saxon army under the prussian command in 1742, saxons problems with the austrian military leaders pre Kesselsdorf, Brühls greatest coup to get a large sum of money from the French for doing nothing(1746)! Great source for the austrian and other german uniforms of the beginning of the war. The best source for uniform-painting for the early years of the war. Great details! A lot (not all) of french regiments. A essential source for many uniforms, although too old fashioned for WAS. But the details are very interesting especially the patterns of uniforms. Important for Research of the elite-Units of Maison du Roi. But you can find a lot of cavalry, dragoons and old infantry regiments too. I will use especially the informations on musicians. It seems as this book is as bad as the book before from Harald Weber about the saxon army of the 17th century and under August der Starke with a great lack of detail and great problems with german orthography! I'm not sure if I should post all these modern online-sources too. Many of the modern illustrations guide me more to wrong informations and confusions. very imformative and nice of you to post,keep up your excellent work. The old austrian book from 1901 gives a interesting Rating for the French army. It explains realy well the high casualities and very common strategic and tactical problems. The authors mention the low social rank the Sous-officiers came from and that the officers did not had much to do with their soldiers. Too Bad Browning is the only one to cover this most intersting conflict in English. It's right. Especialy if you're interested in Flanders, Italy and the important actions in the Caribean wartheatre. I will ad some new books nevertheless. If you have questions about german books, I will help you. the problem isnt the german ,there is always google translation,but the gothic script in old german books and the different spelling,cause me a blinding headache.However if thats what there is thats what there is and even 16th century french or english takes some wadeing through. Münichs work (added today) about the bavarian army is with normal or "modern" script. If you have special questions I can help you and translate 1 or 2 pages. I hope that the Bayerische Staatsbibliothek will add the Staudinger (a major work about the bavarian army under Karl Albrecht). I'm thinking about collecting internetlinks to warpaintings (battlepaintings) of the period. It's a shame that there are so many sources of this war and nobody makes a well illustrated book or better a series of books with all those german paintings in churches etc.. I have a book from the 1930s on the 1870 Battle of Beaumont and even that is written in gothic script. Jean-Engelbert d'Arenberg: "Trois batailles, Salankemen 1691-Dettingen 1743-Hochkirch 1758, et trois ducs d'Arenberg." Enghien, Archives et Centre Culturel d'Arenberg, 2001 ? Sounds interesting, but I don't know if there are more informations about the french side. Arenberg was the commander of the austrian Forces at Dettingen. Any thoughts on German Armies War and German Politics 1648 to 1806 by Wilson, Peter H.? its long and dense but I found it very interesting exploring aspects of German politics that aren't often covered in English. Its a must read and takes us away from the usual Central European centred view. Getting information on the Dutch army of the WAS has never been easy (for example, I despair of finding any descriptions, let alone depictions, of cavalry flags). 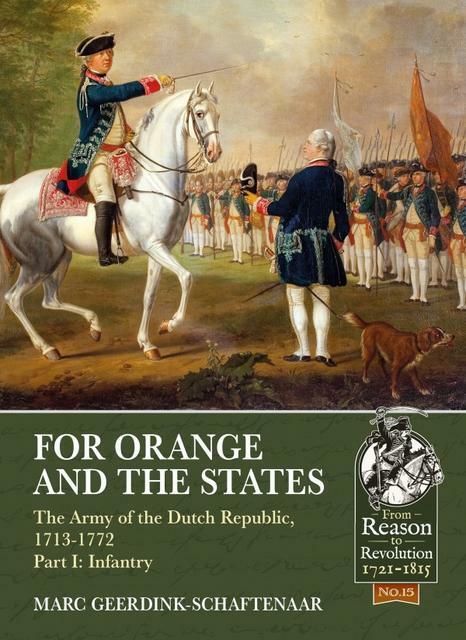 I've no idea how much useful information might be here for the wargamer, but given the paucity of material on the Dutch army out there, I snapped it up without hesitation. There is supposed to be another volume on the way concerning the cavalry and artillery. "En aimant tant la gloire, comment pouvez-vous vous obstiner à un projet qui vous la fera perdre?" Could you be so Kind to write a short (or Long) Review of this book? I think about to buy it but I'm afraid that there is not enough Information about the dutch uniforms in the 1740s. Naturaly I would be happy if that's not the case.